I stumbled across this game and when I read the rules decided to buy it via Amazon.de (as it’s not easily available in the UK) which proved pretty cheap as it consists of just a deck of cards. As you may know from my list of top 10 very portable 2-player games, I like having games that are easy to carry around. 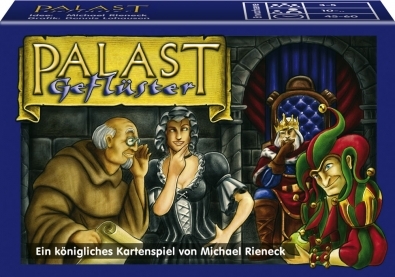 Palastgeflüster is definitely easy to carry and plays 3 to 5 players. The goal of the game is to reach 6 points with 3 players (5 points with 4 players or 4 points with 5 players). The cards display one of the 7 different characters on them as well as a colour around the edge – the colours are either one of the player’s colours or brown. Plus, there are some King cards which are kept separately. 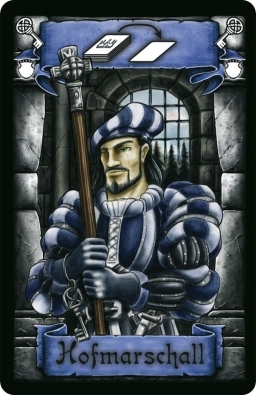 At the start of each round, the deck of character cards are shuffled together and 6 cards are dealt to each player. Players take turns playing one character card from their hand which gets placed in front of the player that played it. The coloured border of the card determines who is the next player to play(if brown one of the players with the fewest cards on the table will play next) and this could be the current player themselves. Each character-type has a special power too such as show your hand of cards to all other players, discard cards and draw replacements from the draw pile, swap cards in your hand with another player, swap cards already laid down, and so on. 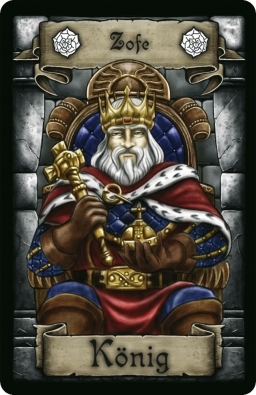 The King cards are turned over as a result of one character’s powers – each King card shows one of the character types and, when displayed, means that the power of that character type does not take effect when that character is played. Overall, it sounds very simple (which it is) but like it will deliver some intriguing game play. Our first round was a bit disappointing – I played a few cards in a row, because I could, and found this was a very poor plan as I ended up soon having to play a duplicate because other players aimed to make it my turn as often as possible. We weren’t sure if the game would have depth but the tactics soon started to show through quickly as we played each round – we all started to utilise the cards’ powers properly, plus we started to manipulate our hand of cards to try and guarantee we could keep playing cards without triggering the end of a round and, thus, score points for our opponents. The power of one card makes you show your hand to the other players which is usually a great way to lose a round as other players gang-up to try and force you to lay a duplicate. So, we started to try and only play those cards when the King’s power negated their effect. When we finished the game, we discussed that we could see other potential tactics available too now that we understood the game better. For example, there’s a card whose power allows you to swap two cards already laid down – we had only used this power to swap a card of our own and someone else’s but it could actually be used to swap any two cards, i.e. the cards of two opponents – the thoughts about the chaos we could cause were very entertaining to us. 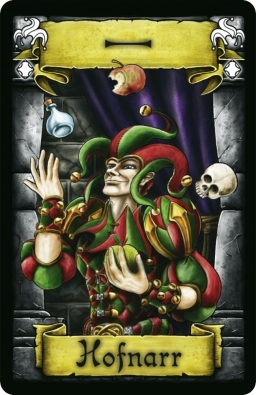 Trying to complete a full line of cards in order to score a point for yourself is very tempting but is (correctly) hard to achieve; however, gaining a point all on your own is a big reward so the temptation is always there. With such a simple scoring system, it seemed very easy for there to be a tie. The tie-break in the basic game is decided on the number of cards in front of the players at the end of the last round. This can still leave things tied and doesn’t take into account play throughout the game. However, there is an advanced rule that instructs players to keep track of the total number of cards laid down during the game for each player and it is that total that will decide the tie-break. This seemed like a good idea and we would use that rule next time. It takes a while to get used to the cards but I liked it that we started to discover some interesting tactical choices as our first game progressed. 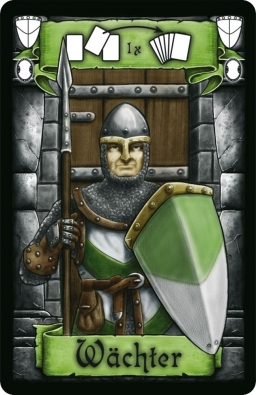 It would have been nice to have a few other character types so that each game could use a different mixture of cards (like Dominion) but that’s just a wishlist item and not having those do not weaken the game. The theme itself feels a bit separate to the game – I didn’t really feel like I was involved in any courtly whisperings – but the idea and the artwork are nice enough and doesn’t detract from the game. Palastgeflüster is a good filler with some decent content to it. I look forwards to playing again. This entry was posted on Monday, January 11th, 2010 at 1:17 pm	and is filed under Board Game Review, Board Games, Palastgeflüster. You can follow any responses to this entry through the RSS 2.0 feed. You can skip to the end and leave a response. Pinging is currently not allowed. Thanks for the tip. This sounds really fun.